(Nanowerk News) There could be more to DVDs than has been assumed to date. The material comprised of germanium, antimony and tellurium in which data media store information may also be suitable as an extremely fast light switch for optical communication or data processing. This is what an international team working with researchers at the Fritz Haber Institute of the Max Planck Society in Berlin and the ICFO-Institut de Ciències Fotòniques in Barcelona has succeeded in finding out ("Time-domain separation of optical properties from structural transitions in resonantly bonded materials"). The storage mechanism in DVDs is based on the fact that laser pulses rearrange the structure of the material, switching it from a transparent to a non-transparent state. As the scientists have now discovered, the optical properties change much faster than the structure, which could be used in designing new types of photonic components. The material is capable of taking on the new functions because the team headed by Ralph Ernstorfer and Simon Wall, scientist at the ICFO-Institut de Ciències Fotòniques, discovered it has a previously unknown property. They found that it changes its optical properties such as transparency, reflectivity and absorptivity instantaneously, while the structure exhibits only a delayed reaction to the excitation. This was quite a surprise for the scientists: “We used to think that optical behaviour changed so quickly because the structure changed,” says Ralph Ernstorfer. Since the structural change would have to happen so rapidly, some scientists compared it to an umbrella flipping inside out, i.e. from the regular crystalline to the irregular amorphous arrangement. Although the structure of GST really does change between these two forms, it is less sudden than a storm blowing an umbrella inside out – to use the same analogy. As the Max Planck researchers have discovered, this is because initially it is only the electronic structure of the material which changes, and it is this factor which is decisive for the optical properties such as transmission, reflectivity and absorptivity. In order to understand what precisely happens here, it is helpful to take a look at the arrangement of the electrons in crystalline GST, where individual electrons in addition to electron pairs bind the individual atoms together. 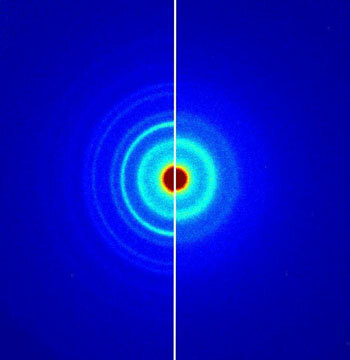 These electrons are not confined to a bond between two atoms. The electronic loners rather participate in multiple bonds simultaneously: they are resonantly bonded, as physicists say. The resonantly bonded electrons dictate the optical properties of crystalline GST, however, they can be moved quite easily to conventionally bonded states. This is precisely what the researchers do with a short, intense laser pulse, with the direct consequence that the material no longer absorbs light as well, but instead allows it to pass unhindered, to a certain extent, and becomes transparent. The physicists observed the change in the electronic and thus in the optical properties by firing a second, also very short pulse onto a thin sample of GST after the first laser pulse. Since they varied the interval between the two light pulses in the process, they were able to, as in a film, record that the electronic structure rearranges itself immediately. “We were able to distinguish between the changes in the optical properties and those in the structure only because we combined this method with a second one,” explains Lutz Waldecker, who played a crucial role in the experiments as part of his doctoral work. He and his colleagues tracked the structural change with short bursts of electrons, which race through a crystal differently than through irregularly structured materials. Since the researchers also sent the electrons after the exciting laser pulse with a different delay, they observed that the regular arrangement of the atoms is maintained longer than the electronic structure. According to the observations, more than five picoseconds – this is a few millionths of a millionth of a second – elapse after the exciting light pulse arrives before the crystal starts to melt. The crystal loses its regular structure in the process. Although five picoseconds sounds short, this time is sufficient to qualify the material for uses other than data storage. Since the realignment of the atoms causes stress and eventually fractures in the material, the atomic lattice of a substance cannot be rearranged infinitely often. But it is precisely this aspect which forms part of the specification profile for a rapid switch in the optical data stream. “If we succeed in quickly removing the energy which is required for the structural change, the crystalline structure could be maintained,” says Lutz Waldecker. The energy could be removed quickly if a GST layer were sandwiched between two thin graphite layers or even between two layers of graphene. The sheets of cross-linked carbon atoms of which graphene is comprised fulfil the necessary requirements. The physicists in Ralph Ernstorfer’s group now want to experiment further with precisely these sandwiches of different materials. “We want to investigate which states the electrons arrive at as they are excited and how the energy can flow away in sandwich structures,” says Ralph Ernstorfer. In this way, he and his colleagues want to bring GST into a position where it can act as a light switch for optical data processing as well.